Several SOOP XBT lines obtain frequently repeated and high-density section data. The frequently repeated lines in the Indian Ocean are narrow shipping routes allowing nearly exact repeat sections. At least 18 sections per year are recommended in order to avoid aliasing the strong intraseasonal variability in this region. The CLIVAR/GOOS Indian Ocean Panel reviewed XBT sampling in the Indian Ocean and prioritized the lines according to the oceanographic features that they monitor (International CLIVAR Project Office 2006). The highest priority was on lines IX1 and IX8. The IOP recommended weekly sampling on IX1 because of the importance of throughflow in the climate system. IX8 monitors flow into the western boundary region, as well as the Seychelles-Chagos Thermocline Ridge, a region of intense ocean-atmosphere interaction at inter-annual time scales. IX8 has proven to be logistically difficult to implement, so an alternate line may be needed. More than 50 papers have been published based wholly or in part on the frequently repeated XBT lines in the Indian Ocean. The research results include to understand the seasonal, interannual and decadal variation of volume transport of major open ocean currents, characterization of seasonal and interannual variation of thermal structure and its relationship to climate and weather (e.g. 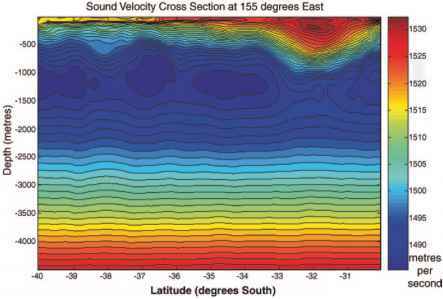 the IOD, tropical cyclones), surface layer heat budget to identify the relationship between sea surface temperature, depth of the thermocline and ocean circulation at interannual to decadal timescales, Rossby and Kelvin wave propagation and validation of variation of thermal structure and currents in models (Masumoto et al. 2009 and references therein).